The model painted like its prototype 2TE70-002 at July 2011, when it works at Sosnogorsk depot of Northern railroad. 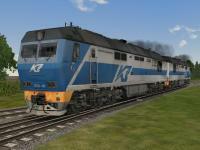 USING THIS DIESEL LOCOMOTIVE 2TE70 ON ANY OTHER SITES WITHOUT PERMISSION OF AUTHORS AND ADMINISTRATORS IS PROHIBITED! The model painted like its prototype 2TE70-007 at July 2011, when it works at Kotlas depot of Northern railroad. The model painted like its prototype 2TE70-003 at 2009, when it works at Ulan-Ude depot of East Siberian railroad.